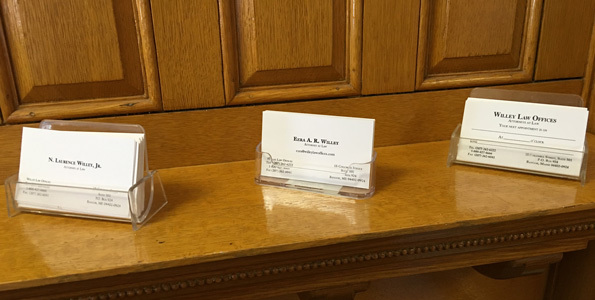 Ezra, the newest addition to Willey Law Offices, graduated from Roger Williams University, School of Law in 2012. He went back to law school after having a first career as a professional glassblower and glassblowing equipment manufacturer, as well as a glassblowing instructor on a number of levels. After Hurricane Katrina uprooted him and his wife from their home in New Orleans, LA, they began the long journey of pursuing new careers, with Ezra deciding on a career in legal advocacy. Ezra is licensed to practice law in Maine and Massachusetts, as well as in the U.S. District Court for the District of Maine and the U.S. First Circuit Court of Appeals. He will be sworn into the Bar of the U.S. Virgin Islands on November 15, 2016. Ezra is also accredited by the Department of Veteran's Affairs, as a Veteran’s Attorney, admittied to practice in front of the Veteran's Administration, handling Veteran Benefit Appeals, as well as admitted to practice in front of the U.S. Court of Appeals for Veteran's Claims. Ezra also focuses in all areas of litigation and shares in his father’s passion for zealous advocacy of his clients. Ezra is also a rostered Guardian ad Litem, rostered to handle both Family Matters and Protective Custody cases. As a lawyer, a parent, an Uncle and as a citizen of Penobscot County and the State of Maine, Ezra deeply believes that the children involved in any litigation in Maine deserve to have his, her or their voices heard and represented to the Court to the fullest degree, and further that these children are placed in the safest environment, and one that will allow them to thrive to the fullest extent. Consequently, Ezra believes that this may be one of the most important roles that he plays as part of his career. Ezra is currently a member of the American Bar Association, the Maine State Bar Association, where he sits on the Board of Governors (the governing body of the Maine State Bar Association), the Massachusetts Bar Association, the Penobscot County Bar Association, to which he serves on the Board of Directors in the capacity of President, the Hancock County Bar Association and is a member of the National Association of Criminal Defense Lawyers, the Maine Association of Criminal Defense Lawyers, as well as the John Waldo Ballou Inn of Court. Beyond serving on the Penobscot County Bar Association's Board of Directors, as President, Ezra is also the Penobscot County representative (District 9) to the Maine State Bar Association's Board of Governors. Ezra also sits on the Board of Directors, in the capacity of President and Treasurer, for the Maine High School Mock Trial Program, and also sits on the Board of Directors for the Volunteer Lawyer's Project, the organization dedicated to helping Maine's underserved population find pro bono legal services, advice and representation in many civil related matters. Ezra lives in Bangor with his wife and two daughters. He enjoys spending his free time with his family, and enjoying all of Maine’s unique outdoor opportunities, such as gardening, hiking, boating, and skiing, amongst others. Contact Ezra A. R. Willey or click here to read his reviews through AVVO.